Unlike his Mother and Father, Ben has had the opportunity to study his chosen career by training at Sparshot College which has in recent years offered its students dedicated Aquatics Management courses. 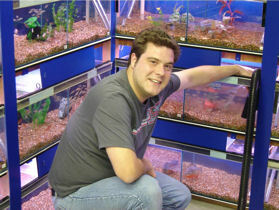 Having obtained his National Diploma in Aquatic Fisheries and Ornamental Fish back in 1996 and completing a business management course Ben returned to work at ’The Water Garden’. Having worked most weekends catching fish and snails and digging plants as a child it was, for him, a life ambition realised. Since then he has set about modernizing and upgrading the fish holding site at the nursery and with his technical skills learned on fish management courses has transformed the care of ornament and tropical fish with new ideas and up to date practices. His outward looking easy going character belies a very dedicated knowledgeable man determined to continue his parents business but in a way that will satisfy the modern sophisticated customer but retain the family values of an earlier age.